Originally featured in the Omaha World-Herald on October 12, 2013. The Omaha Public Library opened a branch in Florence in 1923. To raise the money, 600 citizens formed the Florence Improvement Club and hosted a fundraiser featuring Scottish songs performed by singers in traditional Scottish garb, French dancing, a dramatic sketch and other family attractions. The program raised $100 and resulted in the opening of the community’s first public library at the Florence Building, 8702 N. 30th St. Florence Library was the fourth to join the Omaha library system and the pride of the Florence community. That pride has helped Florence residents weather challenges to their library. The first challenge emerged in 1935, when the Florence Library was split into sub-branches, an unpopular decision among community members who felt they were being deprived of library services. Within 30 days, the Citizens Committee for Restoration of the Florence Branch Library was formed and a resolution was printed in the Florence Times stating that the library would be restored to its original location. 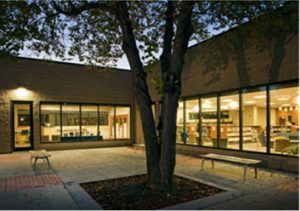 In 1976, the library opened in a new building at 2920 Bondesson St. which it shared with a community center, becoming the Florence Library-Recreation Center. This is the library’s current location. When faced with a budget crisis in 2009, the City of Omaha decided to temporarily close Florence Library and lay off 50 part-time staff throughout the system. Feisty Florence residents raised $35,000 and ignited a movement that resulted in donations of more than $300,000 from private citizens and anonymous donors. These funds kept Florence Library open and retained staff. City Capital Improvement Program funds were used to remodel the branch in 2010, increasing its size by 1,500 square feet. The branch continues to be a priority to the Florence community today.